I’ll be presenting my “Simple Investing” lecture at three TPL branches this winter/spring, so mark your calendars! I’ve created some handouts to give people something to take home and read more. Some are already online, including the Personal Finance Book Guide, and the TFSA vs RRSP Decision Guide. The new handout includes the spectrum of cost-vs-complexity for passive investment options, the importance of fees, as well as a bevy of handy links. I was also on the new Maple Money podcast with Tom Drake recently, and next week will have a presentation in the Canadian Financial Summit, along with over 25 other speakers such as Chris Enns and Preet Banerjee. It’s free to attend if you sign up in advance and watch in the first day after the talk is released; access beyond that limited window requires a paid pass. This isn’t an appearance per se, but I’d like to welcome Ben Felix to Team Mirror as his latest podcast delves into asset location issues at the end of this episode. Finally, a quick note that Questrade has once again tweaked their user interface, so the screenshots in the book no longer exactly match up with what’s on the screen, and it will take some time before I can release a revision and update the errata. In the meantime, I’m sure that seeing TD and old Questrade in the book is enough to give you the knowledge of what is happening in a brokerage and the confidence to start trading and adapt to the tweaks. I’m happy to say that I recently was invited to join a pair of great podcasts that were recently posted. I sat down with Jessica of the Mo Money podcast to talk about the book and some of the story behind it. I was also a guest on Because Money recently, where we talked more generally about who should be do-it-yourself investors. Interestingly, after we recorded that (but before it went live), Dan Bortolotti (of Canadian Couch Potato) gave the final talk of the Canadian Personal Finance Conference, where a major theme was the failings of investor behaviour, and how he’s grown more pessimistic over the years as to how many people should be taking a DIY route to investing. I agree that behaviour is a major factor in success, but am more optimistic that with good processes and education investors can be successful (but Dan has seen more cases than I have so my optimism may not be as rooted in reality). Just a quick post to let you know that I was a guest on the Build Wealth Canada podcast with Kornel Szrejber, and part 1 is now live on his site. We chatted about the book and index investing, mistakes investors make, and more! 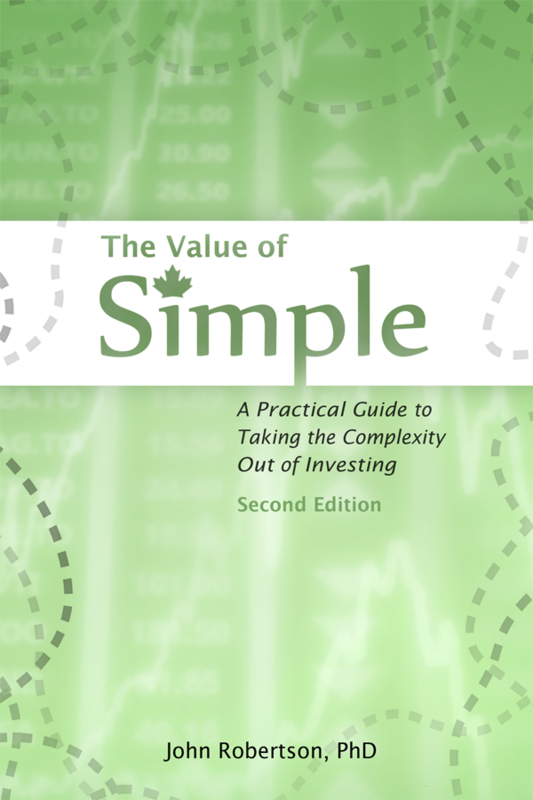 Be sure to check it out for a chance to win a copy of the Value of Simple as well! Also, Sandi Martin and I have been invited back to TPL to give our Money 201 presentation at the Agincourt branch on May 4th. Click for directions and details! And of course, the 2015 Federal budget has changed the TFSA contribution limits (you now get $10,000 of new contribution room each year, with no inflation adjustments to come), so a note about that has been added to the errata page. I will be hosting a book launch for The Value of Simple on Saturday November 29! The event will feature a short talk by me (and I have forsworn PowerPoint to ensure it stays short) on the importance of investing and the book in general, followed by a Q&A. Please sign up and find more details here. If you ask any questions you may have in the form I can prepare in advance, but I’ll also answer any that come up at the event. I’ll be appearing on the Because Money video podcast on Wednesday October 8 — episode 23 if you’re looking for it in the archives. In addition to the book, we’ll be talking about anonymous internet advice. Update: the show and a transcript are now up on the Because Money site!